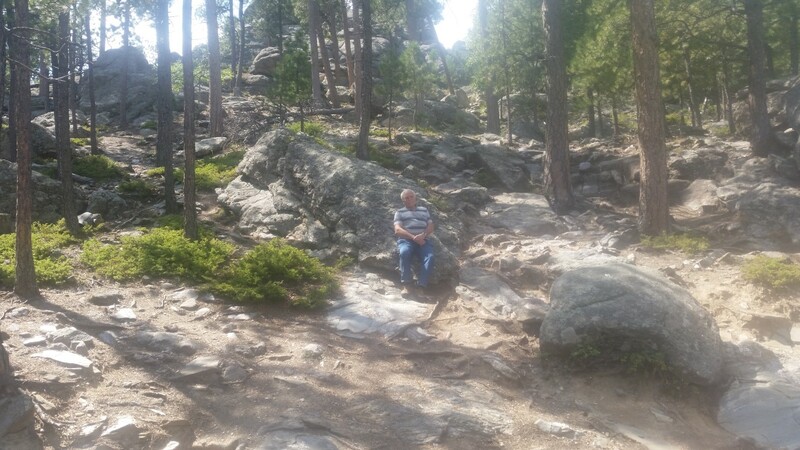 Monday, August 21, 2017 – Last Friday, Roy and I went to see the famous Mount Rushmore, in Keystone, South Dakota. My poor husband has so much to put up with, being married to me. 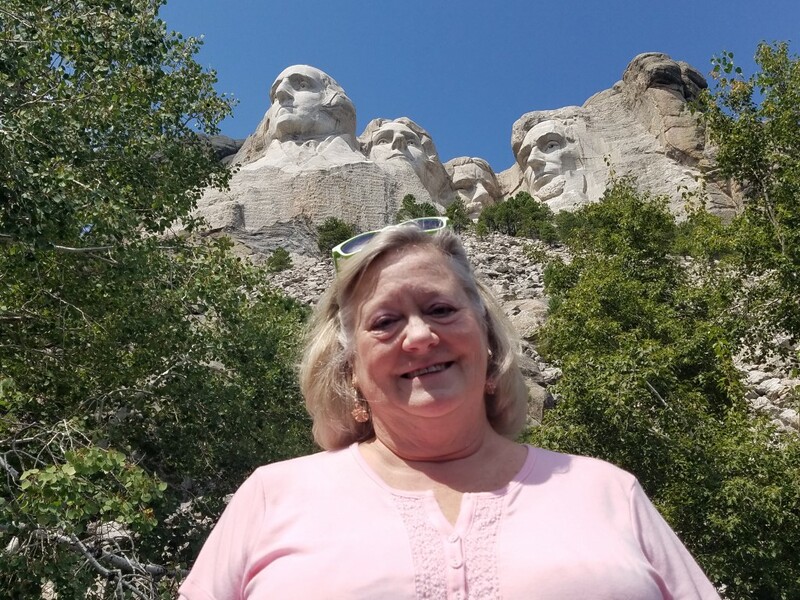 My thoughts of how it would be like to see Mount Rushmore in person did nothing to prepare me for seeing it from a couple of miles away while we were on our way there. When I saw it I screamed (in the car) and poor Roy almost had a heart attack while he was driving! I started clicking pictures and after taking more than 100 photos of Mount Rushmore from every angle I finally calmed down!!! Mount Rushmore National Memorial is a massive sculpture carved into Mount Rushmore in the Black Hills region of South Dakota. 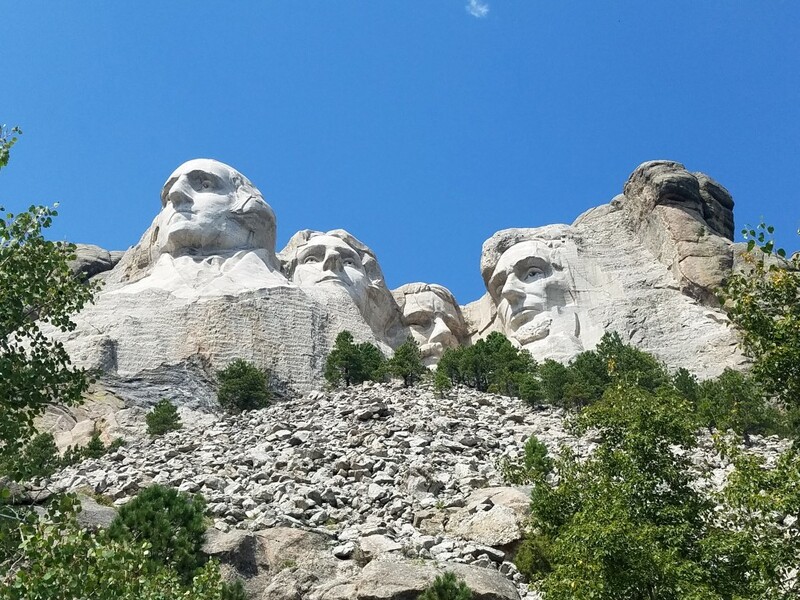 Completed in 1941 under the direction of Gutzon Borglum and his son Lincoln, the sculpture’s roughly 60-ft.-high granite faces depict U.S. presidents George Washington, Thomas Jefferson, Theodore Roosevelt and Abraham Lincoln. The first thing you see is the Avenue of Flags The 56 flags represent the 50 states, one district, three territories, and two commonwealths of the United States of America. We found our Louisiana flag as we were leaving. 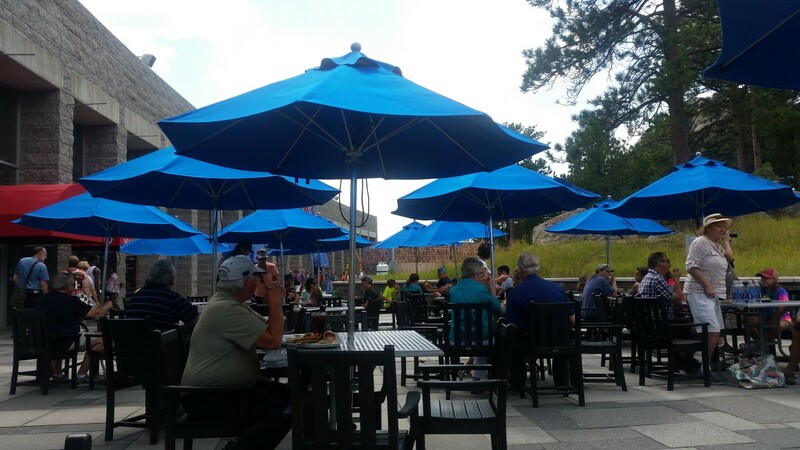 Even though I did some research before we went, I imagined Mount Rushmore to be a place you went to sit or stand in one place and just look at. Yes it was that but it is so much more than that. 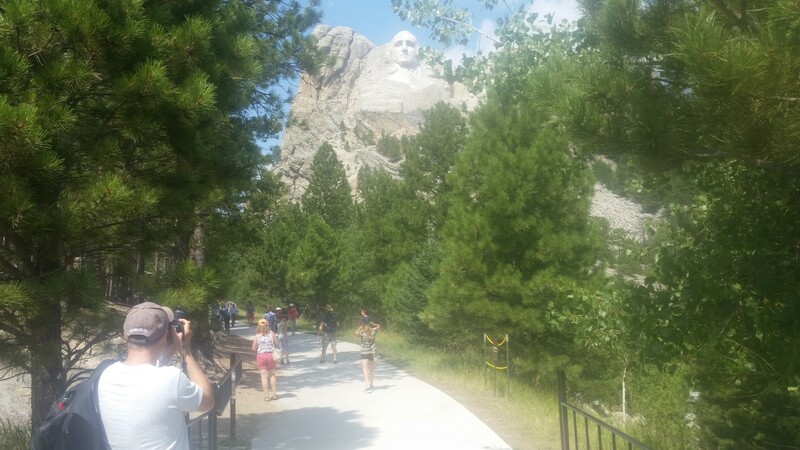 Presidential Trail is the walkway that brings you to areas closer to the monument where you see it from different angles. 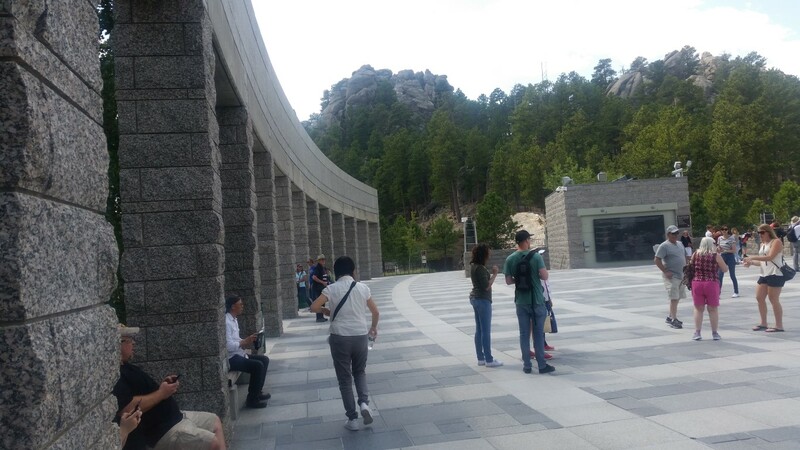 This was a nice shaded trail around Mt Rushmore and they have plenty of benches to sit down and rest. 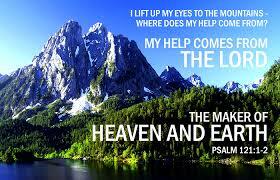 It was not an easy hike for me since there are 422 stairs going up and down included in the .6 mile walk. I loved every step we took however, because of what we saw. When we were finished we treated ourselves to ice cream cones and sat outside watching baby squirrels play. Here’s some photos in the order in which they were taken. 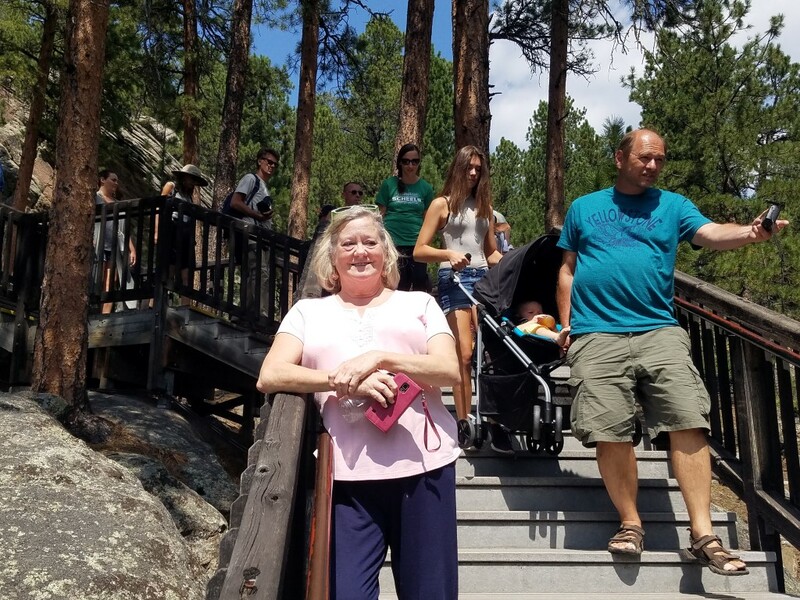 Come along with us as we walk and climb around Mount Rushmore. 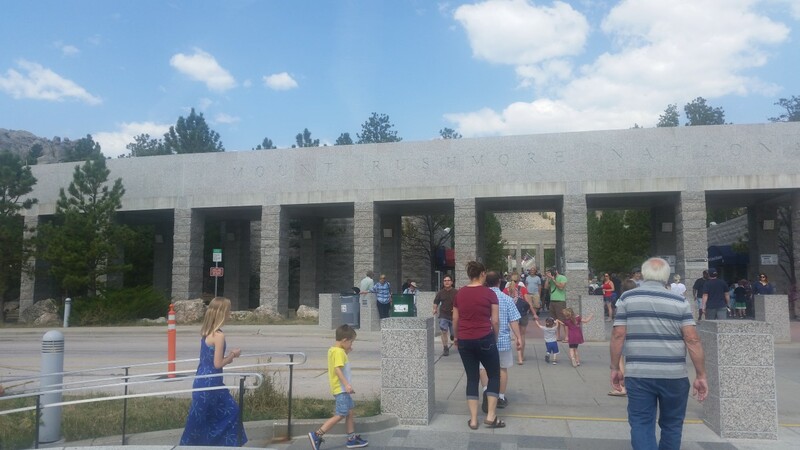 It is free to see Mount Rushmore but you pay for parking. It’s normally $5 a person but since we are old it was only $5 for both of us! 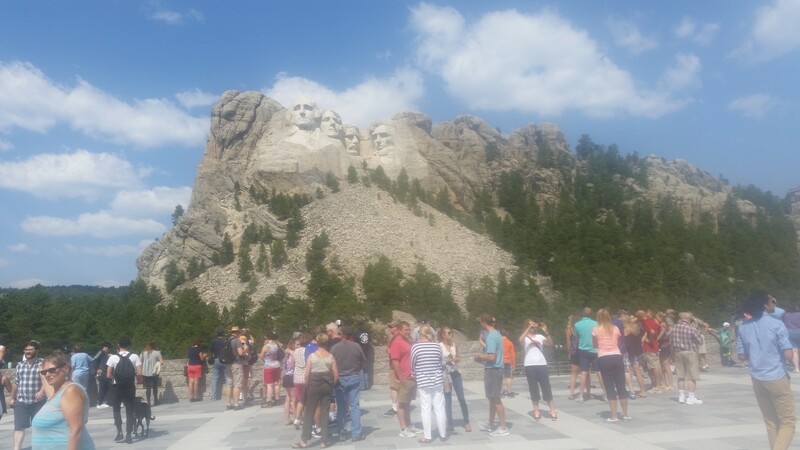 Over 3 million tourist visit Mount Rushmore each year! 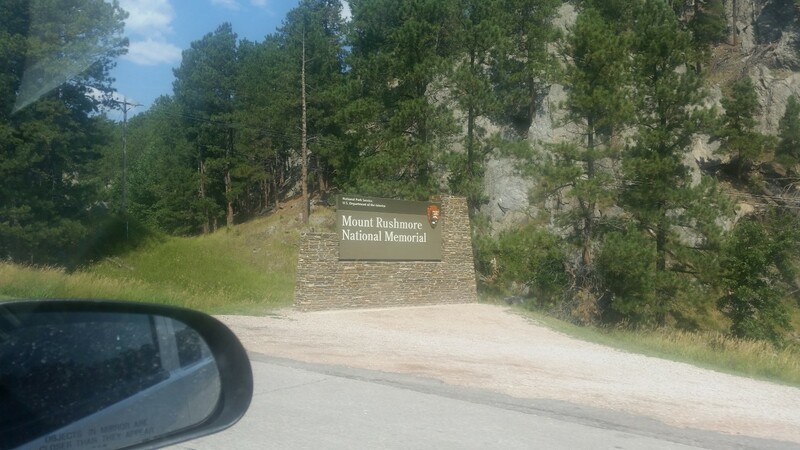 We enjoyed getting to show Mount Rushmore to Chip and Madisyn on Facebook Messenger. We love getting to share with our family when we see something cool! 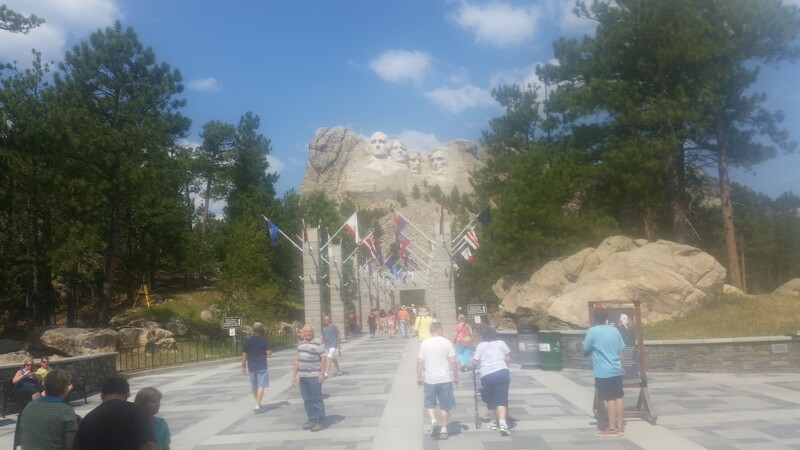 This one is a panoramic photo of the area you can stand or sit all day and look at Mount Rushmore! This is where the President’s Trail begins. 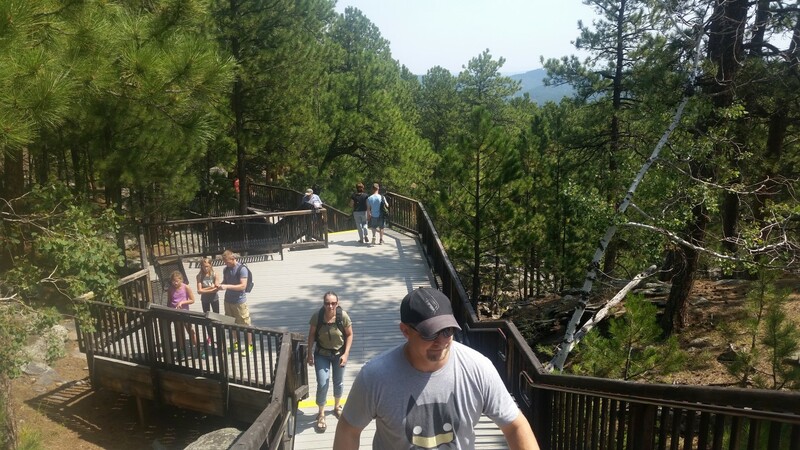 Its a combination of cement walkways and wooden stairs drawing you closer and closer to the monuments. I called this the looking up their nostrils angle! 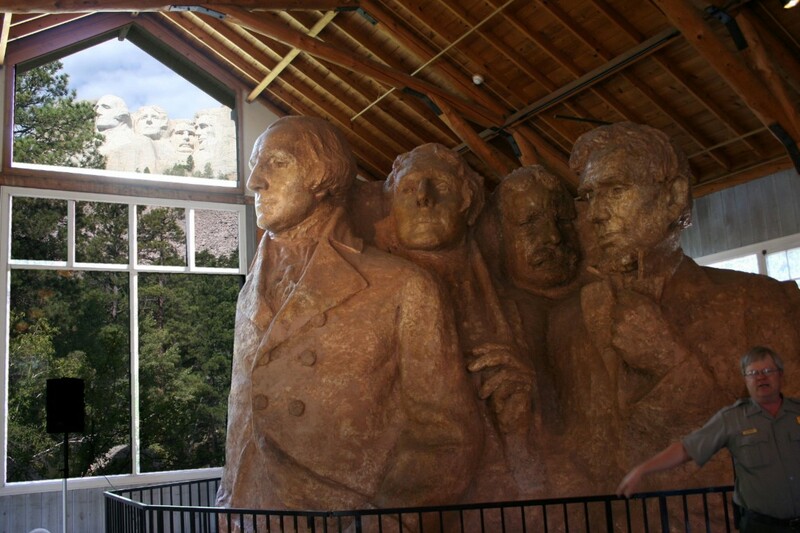 Inside a building, at the end of the trail, was a mini replica of Mount Rushmore. 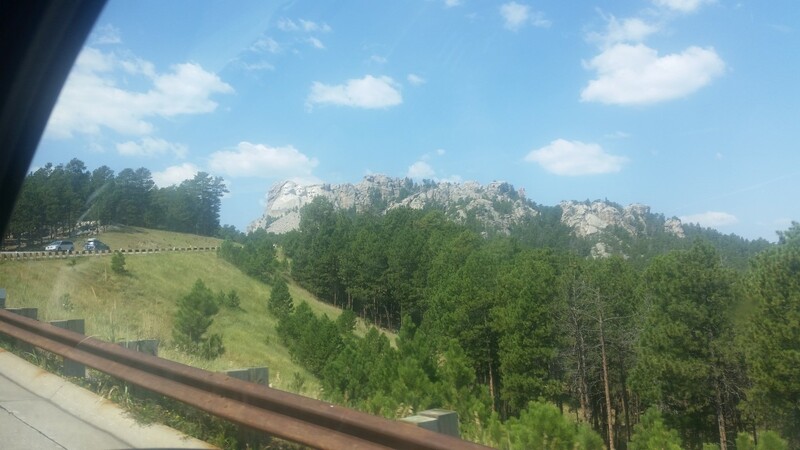 It can be seen at the same time as looking through the window at the real Mount Rushmore! The place we rested and enjoyed some ice cream at the end of the trail! Here’s some information about Mount Rushmore that I obtained from the internet. •90% of the heads were carved with dynamite. •There were nearly 400 workers who helped create this memorial. •Total cost of memorial was $989, 992.32. •No one died during the carving of the memorial. •Rate of erosion of heads: 1 inch every 10,000 years. 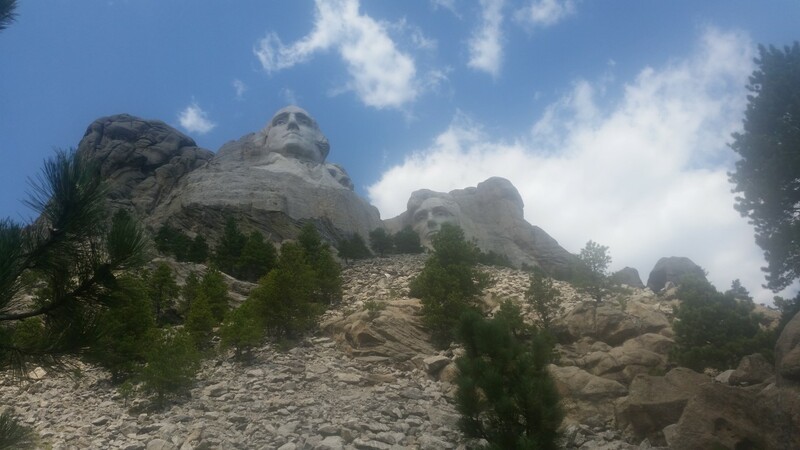 •Mount Rushmore is 5,725 feet tall. •Mount Rushmore was named in 1885 for New York lawyer Charles E. Rushmore. I truly didn’t think we’d ever come back to South Dakota. Since we are here now, I have to say I really like a lot of what we’ve seen in this our official state of residency. 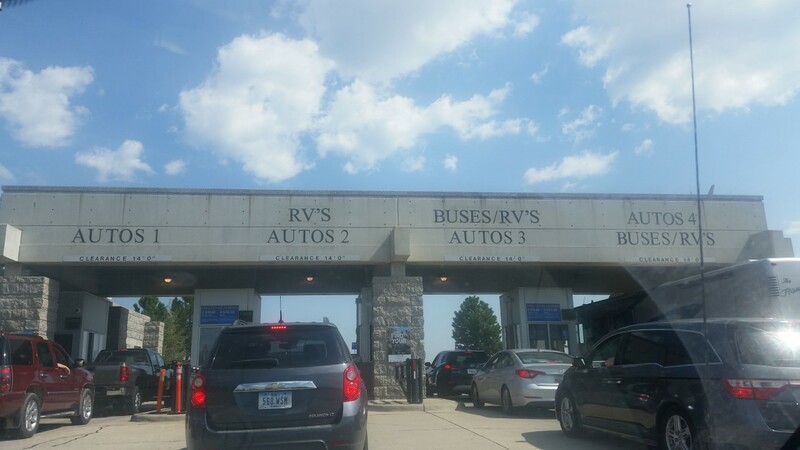 If you don’t know about an RVers state of residency, I’ll explain. When you live in a motor home you actually live all over the country so you can choose whatever state you want as your state of residency. 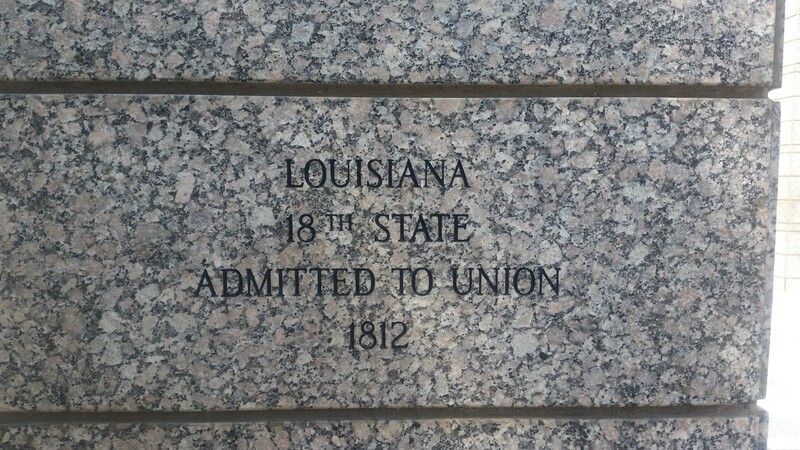 We chose South Dakota almost five years ago mostly because auto insurance in South Dakota is half of what it was in Louisiana. When we are buying coverage for our truck and a large motor home, that is a significant savings. 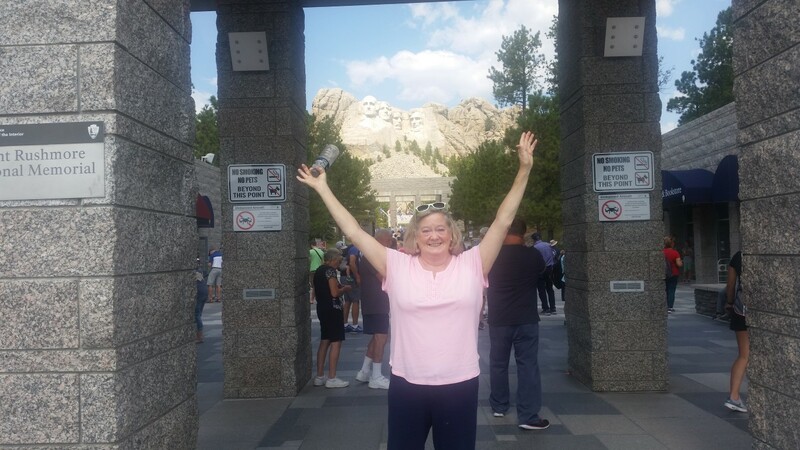 When we became residents of South Dakota we stayed one night in Sioux Falls, South Dakota which is at the opposite end of the state, around 350 miles east of Mount Rushmore. When we originally became South Dakota residents we were on our way to Minnesota to live for several months so we only got to see South Dakota for one day that time! 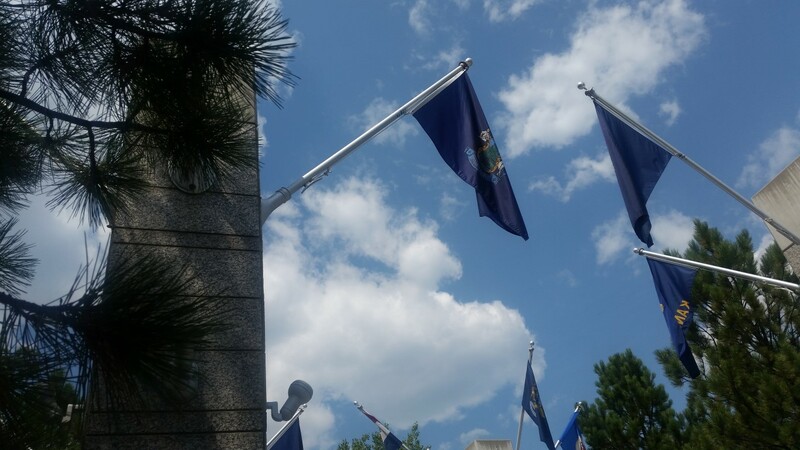 We set up an account with a mail forwarding service,MyDakotaAddress.com in Madison, SD where all our mail now goes to. 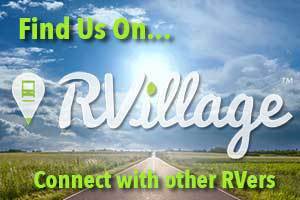 When we want our mail we call them and give them the address of the RV park we are staying in and a few days later it shows up. Our drivers license, voting, mail and auto insurance are all South Dakota. There is also no state income tax in South Dakota!!! We voted during the Presidential election via mail with South Dakota. All of this makes living on the road a little bit easier to coordinate. 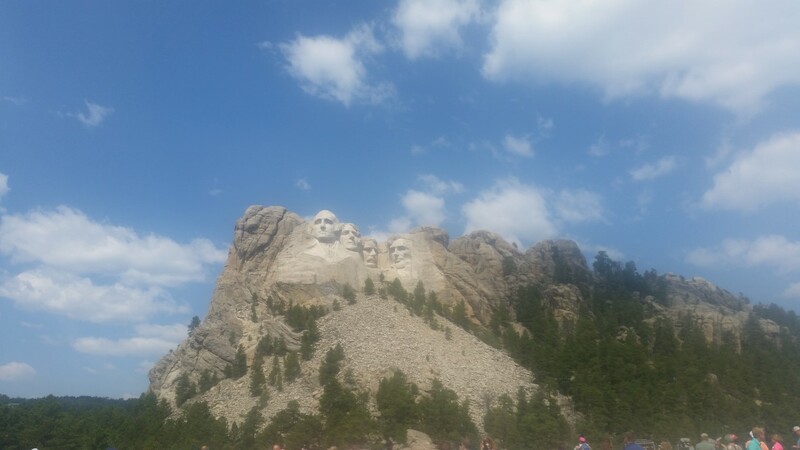 Saturday we went to Sturgis, SD, the city that around 500,000 motorcycle riders call home for over a week each year. This year the annual event was a week before we got here. Sunday we went to Wall, SD to see the famous Wall Drug. This was another place I had not thought in any way would be like it is!